1. 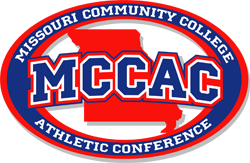 The Midwest Community College Athletic Conference will adhere to all NJCAA rules and regulations. Any playing rules not stated in the NJCAA manual will refer to NCAA rules of play. 2. All coaches and players will adhere to the “No Tolerance” rule for foul and abusive language. Offenses will result in a game ejection with a subsequent game suspension. 3. Any act of violence/fighting will be dealt with according to NJCAA rules. First red card offense for violence/fighting is a game ejection and a two game suspension. The second red card offense for violence/ fighting is a game ejection and immediate suspension for the remainder of the season (See NJCAA sportsmanship rules about reporting). 4. SPORTSMANSHIP is strongly encouraged. Understanding the integrity of the game and promoting that victory has no value if achieved unfairly. (See MCCAC Sportsmanship Code). A “Team Sportsmanship Award” will given annually. Coaches will vote at the end of the season. 5. RESPECT for opponents, teammates, officials, and spectators should occur at all times on the playing field. 6. ALL –CONFERENCE TEAM selections will consist of 11 players on the first team and 11 players on the 2nd Team. “Coach of the Year” will go to the Conference Champion. 7. TIE BREAKERS for the conference championship will go to head to head competition first. Secondly, goal differential in head to head games will be used determine a champion. If this doesn’t constitute a clear champion, then co-champions will be awarded. 8. SCHEDULING of games will conducted by the conference coaches. All cancelled games should be made up within the agreed date of the two coaches. 9. CONFERENCE GAMES- If teams play twice in the regular season only the second game will count towards conference standings. 10. A CONFERENCE ASSIGNOR will be designated to assign officials to all conference competitions as agreed upon prior to the start of the season. 11. A RAIN DATE of the Monday before regional play should be reserved in all game schedules to make up conference games. 12. Alcohol and drug usage will not be tolerated during NJCAA competitions.